Eggs can be prepared and eaten in many ways. Alone, they can be boiled, poached or scrambled. They can also act as a topping or be mixed with other ingredients to make dishes like egg salad and tuna salad. However, the way you cook your egg can affect its nutrition, meaning that a boiled egg's nutrition might be different from that of a scrambled egg. This is because of the heat applied during the cooking process. Eggs were once thought to be bad for you because of their cholesterol content. However, eggs in moderation are now said to be healthy. The American Heart Association recommends one egg per day, which may be able to help reduce the risk of heart disease and stroke. Even eating more than one egg per day isn’t bad for most people. A 2018 study in the American Journal of Clinical Nutrition showed that up to 12 eggs per week won’t negatively affect your health. Why would you eat an egg or more per day? Well, they’re used in the production of a wide variety of foods. From cookies to cake, soufflés to soups, and a myriad of breakfast items, eggs are incorporated into many everyday dishes. However, the ways the eggs are used can affect their nutrition. This means one egg a day in a soufflé might not be the same as the raw egg used to make mayonnaise. Specifically, it’s heat that influences the nutritional values of eggs. According to the American Egg Board, raw eggs contain many beneficial nutrients. One large egg has vitamin A, several B-complex vitamins, vitamin D and vitamin E. It also has several minerals, including calcium, copper, iron, magnesium, manganese, phosphorus, selenium, sodium and zinc. The nutritional value of eggs doesn’t stop there. Eggs are also rich in protein, with about 6 grams of protein per egg. They also contain lutein and zeaxanthin, good nutrients for eye health. Many eggs are enriched with healthy fatty acids — the same type of healthy fatty acids you get in fish oil or omega-3 rich foods. Most people cook their eggs — after all, a raw egg is a slimy and unpleasant food to eat on its own. That being said, raw eggs are often used to make desserts or salad dressings. It’s generally considered a good idea to cook your eggs, though. When heat is applied to eggs, it reduces the risk of salmonella poisoning. Cooking eggs can also make eggs digestible for people with egg intolerance or allergies. Although heat is necessary to cook eggs and eliminate bacteria, heat can denature egg proteins and nutrients. The different ways you cook your eggs can reduce the amount of proteins, healthy fatty acids and carotenoids you’re getting in each serving. In general, the higher the heat, the more destructive the method of cooking. So techniques like frying your eggs are likely to be the most detrimental to their nutrients. In general, regardless of how you're cooking them, use of low to medium heat creates the healthiest way to eat eggs. Scrambled eggs are the most popular ways to cook eggs in the U.S. Typically, scrambled eggs are cooked over low heat and often aren’t cooked all the way through. This cooking technique lets you retain many nutrients while still eliminating harmful bacteria like salmonella. 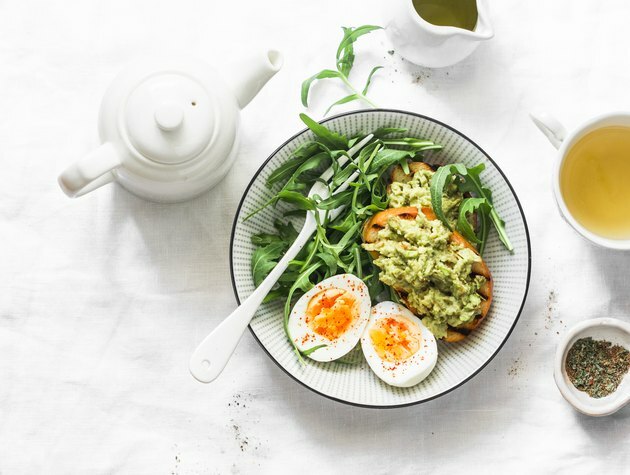 As long as you’re using healthy fats like extra virgin olive oil when cooking your eggs – and taking into account the calories you're adding via oil – scrambled eggs can be a nutritious part of your diet. Boiled eggs are the third most popular way to cook eggs. You can soft boil eggs, leaving the yolk only partially cooked, or hard boil them, which makes them easy to chop up and integrate into salads or other foods. While this method of cooking eggs is popular and facilitates taking them somewhere on the go, boiling reduces the nutritional value of eggs. Lutein and zeaxanthin, the nutrients that are good for your eyes, are found in egg yolks. When you boil an egg, the amounts of these nutrients are reduced, particularly zeaxanthin. Because heat affects the nutrition of your eggs, soft boiled eggs have an advantage over hard-boiled eggs. Soft boiled eggs are easier for your body to digest, and they retain more beneficial nutrients than hard boiled eggs. When comparing scrambled eggs and hard-boiled eggs, the USDA Nutrition Database shows higher protein content for hard-boiled eggs. However, in general, the cooking process seems to affect the nutrients in eggs in equivalent amounts. Although there are higher values of B-complex vitamins and selenium in hard-boiled eggs, there are more healthy fats, vitamin D and vitamin K in scrambled eggs. A hard-boiled egg also has fewer calories than a scrambled one, but the difference is small — only 12 calories. On the whole, both boiled and scrambled eggs are good for weight loss, as they have similar nutritional values. American Heart Association: Are eggs good for you or not? Is it Healthy to Eat Raw Eggs? Can You Safely Eat Raw Eggs?